Ira Nayman, Luna for the Lunies! Smashwords/CreateSpace, 2012. Pp. 276. ISBN 978-0-9876996-2-6 (digital)/978-1470053734 (print). $0.99 (digital)/$14.95 (print). Luna for the Lunies! is Ira Nayman’s third humorous science fiction collection of ‘Alternate Reality News Service’ articles. The News Service provides journalism without bounds, for their operatives will travel anywhere in multi-dimensional time and space to bring to print all that’s relevant in this universe or, indeed, any other universe you’d care to imagine. Add an ‘Agony Aunt’, an ‘Ask the Tech Guy’, and an odd ‘Unlived Lives Obituary Column’ and the recipe is there for a Monty-Python-meets-Douglas-Adams-like romp across time and space and all in-between. I have to talk first about the structure of Luna for the Lunies!. Each journalistic article is presented one after another as an independent piece of writing, with no lead-in from the last story or lead-out to the next. It makes for a blistering pace, and an unusual reading experience in which one can never quite know what’s coming next. I had to read it in short bursts, otherwise I felt like I was drowning in notions and ideas with nothing solid to hang on to. In many ways, reading this work in small doses is not a problem. With no real story, characters or narrative throughout, Luna for the Lunies! is never going to be a book you can’t put down. There’s never going to be any ‘page-turner’ element to the work. Indeed, it felt odd that when I did break and then go back to reading, I’d no real notion to think or care about what had gone before because it really didn’t matter. What had gone by had no relevance to what was to come, and in truth I could have picked up the book and opened a page randomly and read on without any trouble. It’s very much a work ‘of the moment’. It was odd because I’d never read anything like that before. And, of course, all that’s not a completely valid criticism, because I think Nayman is not trying to create Luna for the Lunies! as anything I’d read before. In some ways he’s ploughing his own furrow, and in the words of the author himself: “If you don’t like this reality, try another one”. I think his readership will be divided in their judgement. So, with no structure, characterisation, or extended narrative this book surely has to stand or fall on its content. It’s a brave stand, because humour in any genre is devilishly difficult to write, not least because of its subjective nature—what drives you to uncontrollable laughter may well leave me cold. But given Nayman’s scope is huge—not only does he have this universe from which to bring to us the bizarre and sublime, but he has at his whim any universe his imagination can create—the potential for fun is vast. The book starts out very promisingly. It talks about infinities and multiple universes and split timelines with universes branching out from the most innocuous of human occurrences in a confident, fun, Adams-style right down to a ‘Welcome to the Multiverse—sorry for the inconvenience’. I love the thought that while there are infinite numbers of each of us living infinitely different lives, there is a guy out there named Corey Haim who inexplicably lives the same life in each different universe. There’s a nice perversity to touches like that. There are many delicious ideas presented throughout, such as the report of a woman so nagged by her ‘smart house’, or rather the ubiquitous microchips installed within it, as the fridge and mirrors conspire to force her to lose weight, dress better, etc, that she burns the house down and bribes the fire department to take their time dousing the blaze. I could see something like that happening one day. Again this is Adams-like technology gone mad. There’s the story of Constance McPhaedra hacking into the government computers and firing off twenty-seven nuclear missiles to spell out ‘I love you, Sarah Marshall’ in the skies. Another gem tells the story of the Lunies and the campaign for the Mayor of Luna City, which portrays the daftness of human political nature in all its Pythonesque glory. Just as there was genius in Monty Python, there was also much that descended too far into silliness for its own good, and the same can be said for Luna for the Lunies!. While there were stories in there that had me grinning inanely, there was also much that left me scratching my head. But, given the experimental nature of what Nayman is trying to create (and presumably has already created in the previous two ‘Alternate News’ series—Alternate Reality Ain’t What it Used to Be and What Were Once Miracles Are Now Children’s Toys [which I will have to look over]), I think I can forgive the odd dud of a story. Running throughout, over several chapters interspersed as ‘interludes’ amongst the madness, there is a more conventional short story. In truth, given all that’s around it, it feels a little out of place, as if it’s there because even Nayman feels he has to put some sort of island of conventionality for the reader to climb upon and draw breath. In summary, Luna for the Lunies! is an interesting work that will simultaneously delight and infuriate you as a reader. Nayman should be applauded for attempting such a work in the format he has chosen, and at the same time should be locked up for the readers’ safety. I hope he’s supported by some decent sales figures; after all we need those writers who will go out on a limb for their art. Ira Nayman is certainly one of those writers. 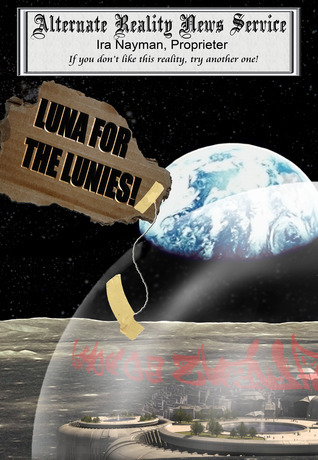 You should pick up Luna for the Lunies! and see for yourself.